UPSSSC Technical Assistant Group C Recruitment 2018: Uttar Pradesh Subordinate Services Selection Commission has released an official notification for Agriculture Service Technical Assistant Class III Vacancies 2018. Before 23rd August 2018 (Last Date to Apply Online), job volunteers can apply for 2059 vacancy posts. Most important of all educational qualifications and eligibility criteria is that a willing aspirant should have completed graduation in Agriculture from a recognized university. As per rules, Ex-Servicemen/ OBC/ ST/ SC/ PH candidates will be allowed for age relaxation. While for general category candidates minimum and maximum age are 21 years and 40 years respectively. Exhaustive selection procedure to be carried out in two phases – Written Examination (Phase I) and Interview (Phase II) of recruitment. Rs. 185/- and Rs. 95/- respectively will be charged as an application fee from General/ OBC (other backward class) and ST (Scheduled Tribe)/ SC (Scheduled Caste) category candidates respectively. While registration fees are just Rs. 25 for PH (physically handicapped) category aspirants. Total 50 questions of two marks each will be asked in the question paper on yet to be announced test date. And, a total of 2 hours will be awarded to solve 200 MCQ (Multiple Choice Question) type problems of 400 maximum marks. As per UPSSSC Exam Scheme, subjects included in the syllabus are Common intelligence tests, General Knowledge, General Science and Maths and General Hindi. Total vacancies are divided category wise as follows for bachelors degree holders in Agriculture from any recognized university. As of now, official notification of recruitment is only made available in the Hindi language in PDF on official website www.upsssc.gov.in. 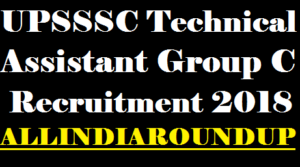 For remaining updates of UPSSSC Technical Assistant Group C Recruitment 2018, 2059 Vacancy Notification, Application Form/ Apply for Online Registration Last Date, Exam Date, keep visiting ALL INDIA ROUNDUP regularly.